Digital signage is booming. From stores to offices and public buildings, screens are now commonplace. This is a domain our partner Screenly masters, managing 10,000 screens and counting. Their secret sauce? Simplicity! Their system is plug and play, making it possible to deploy a screen within minutes. 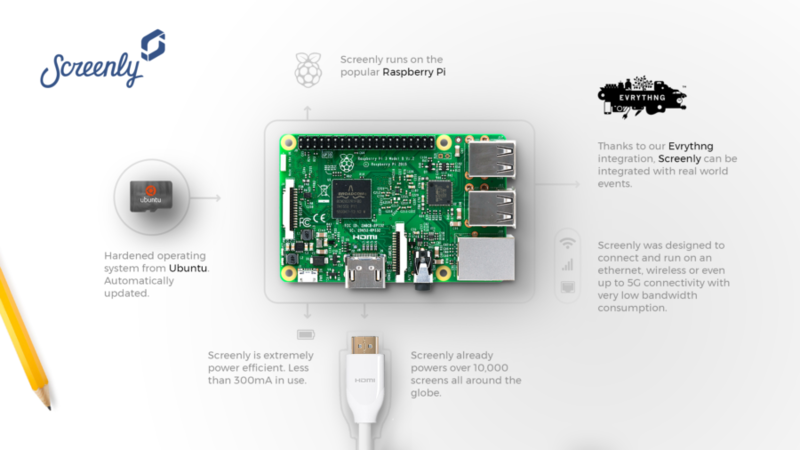 Screenly’s system is built on the popular Raspberry Pi platform and running the new Ubuntu Core operating system, a cutting-edge operating system tailored to deploy apps in the real world. A few weeks ago, Ubuntu, Screenly and EVRYTHNG sat down together to see if we could work on disrupting the digital signage world with a simple, yet very actionable solution to connect digital screens and products in store. EVRYTHNG is already busy giving millions of products a digital life with a number of leading brands. Imagine if these products could communicate with digital signage without the need for any app to be installed, but instead simply by scanning the EVRYTHNG identities on the products from the Web. There are plenty of scenarios in which a product and a screen could tell great stories: Are these shoes available in my size? Is this shirt 100% waterproof? What would I look like in this jacket? What’s best to eat with this wine? The result is an integrated solution that we presented at Mobile World Congress 2017. Simply scan an item from the Web or by tapping an NFC tag, and off you go. You get the stock inventory in the screen in front of you, a video describing the product on the main screen and some related content on your phone. How does it work? Products that are digitally enabled with EVRYTHNG get a unique URL each, such as https://tn.gg/HLqc3H8j. This URL can be serialized in a QR code, in an NFC tag or via image recognition. All of these formats (and many more) are supported via our scanning tool, SCANTHNG. SCANTHNG is also available as a Web SDK, meaning that consumers don’t need to install an app to interact with products. Instead, they can scan from a Web page on their phone. Next, the image is sent to the EVRYTHNG platform, where the product is uniquely identified. The Reactor™ in our platform then programmatically decides what to do. In this case, the user is redirected to a landing page about the product, and the Screenly API is sent the product identifier, stock inventory and any other information that will be used to display the interactive information on the screens. Such a system can be put in place within minutes thanks to the three platforms: Screenly, Ubuntu Core and EVRYTHNG. It also illustrates the power of products #BornDigital™ with Web capabilities: They can trigger experiences in the real world by combining their data and services on the Web!